Original animation to be included in the BD and DVD volume releases of Machine-Doll wa Kizutsukanai. Volume 1: "Soshite Futari wa Manabisha e (Then The Two Goes to Learning Dorm)" Volume 2: "Irori, Rotenburo de Sosou suru (Irori being Careless at Open Air Hot Spring)" Volume 3: "Char and Frey, Senritsu no Bathroom (Charlotte and Frey, Fearsome Bathroom)" Volume 4: "Akabane Nadeshiko, Natsu no Yo no Yume (Nadeshiko Akabane's Midnight Dream)" Volume 5: "Kojin Jugyou: Imishitsu de Bijo Futari to~ (Private Lesson: Alone In the Nurse Room with the Pretty Lady)" Volume 6: "Bishoujo Shuugou! Mizugi Darake no Daisoudou (Pretty Girls Gathered! The Great Tumult of Full of Swimming Suits)"
Watch Machine-Doll wa Kizutsukanai Specials Episodes Online at Animegg.org. 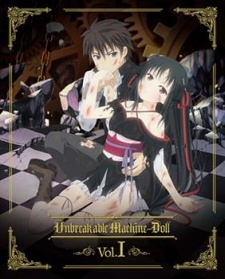 Machine-Doll wa Kizutsukanai Specials is available in High Definition only through Animegg.org. Choose an episode below and start watching Machine-Doll wa Kizutsukanai Specials in Subbed & Dubbed HD now.